Reducing, reusing & recycling are important steps in going green. Dancing, daunting & distracting are important steps in being green. You and I may have the three Rs mastered, but no one has perfected the three Ds like Force and Sully. When the Nashville Predators stopped by GM Place on December 22, 2009, the hostile Vancouver Canucks were quick to usher them out of town with a 4-1 loss. Eight different Canucks found the scoresheet and Daniel Sedin was one of them, his power play goal with less than four minutes to play in the second period stood as the game-winner. 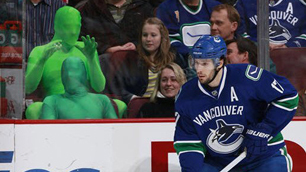 Not credited with assists on Daniel’s eighth goal of the season were the green men Force and Sully, the eccentric menacing duo seated adjacent to the visitor’s penalty box enveloped from head to toe in skintight green nylon. With Dave Scatchard in the sin bin for goaltender interference, Force and Sully pumped up the crowed by pestering the former Canuck. They waved their arms to called him over, then proceeded to mimic someone crying and scale the penalty box glass, all the while treating the penalized Scatchard like a caged orangutan. All the excitement was broadcast on the scoreboard, which incited laughter from the crowd and anger from Scatchard, who grabbed a towel and tossed it over the penalty box camera. Their antics paid off, they got to a player and the Canucks even scored on the man advantage. With that, Force and Sully were born. They returned the next game and repeated their dancing, daunting & distracting for the Edmonton Oilers, Vancouver’s next victims. Three Canucks home games have passed since with no sign of the dynamic duo, but fear not, they’ll be live and in the spandex when Vancouver hosts Nashville on January 11. 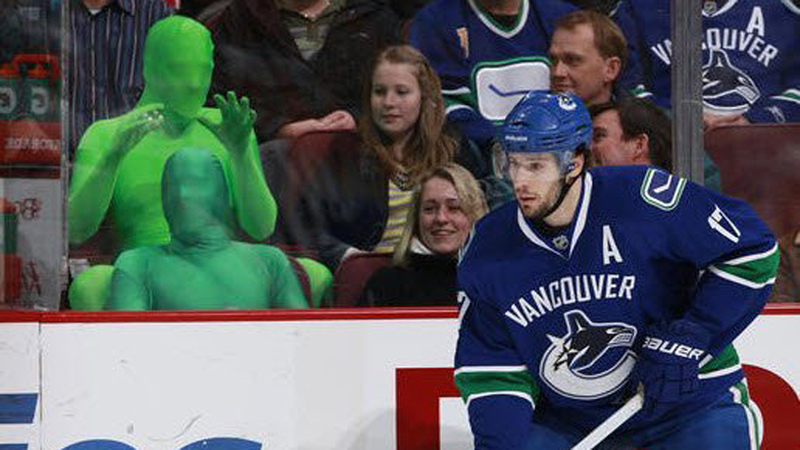 Not a lot is known of the green men, except that they’re not the first to sport full green bodysuits. 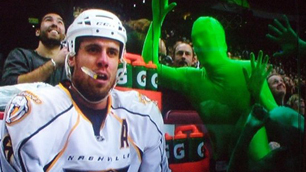 As ESPN’s Toby Mergler discovered last October, green men have been popping up at sporting events since the TV show “It's Always Sunny in Philadelphia” first aired an episode based on a true events that played out for Rob McElhenney, the star and creator of the show, following a Philadelphia Eagles win over the Dallas Cowboys. 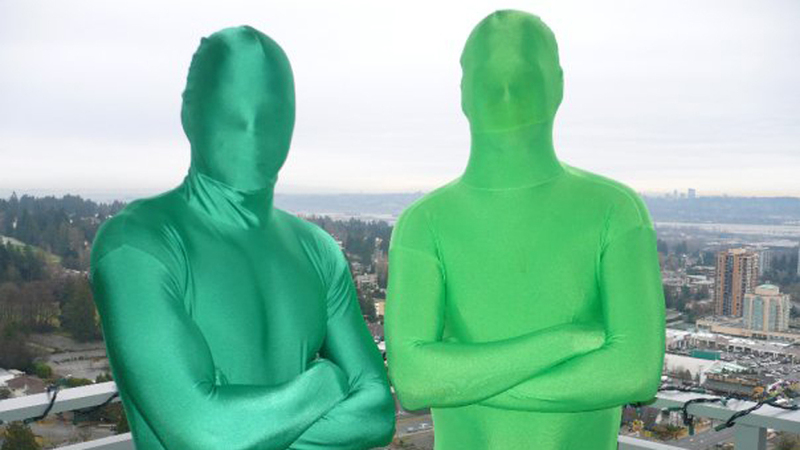 Force and Sully, journalism students at BCIT who do not want their true identities revealed, are huge fans of the show, so much so they set out to spread the green man tradition in the NFL. 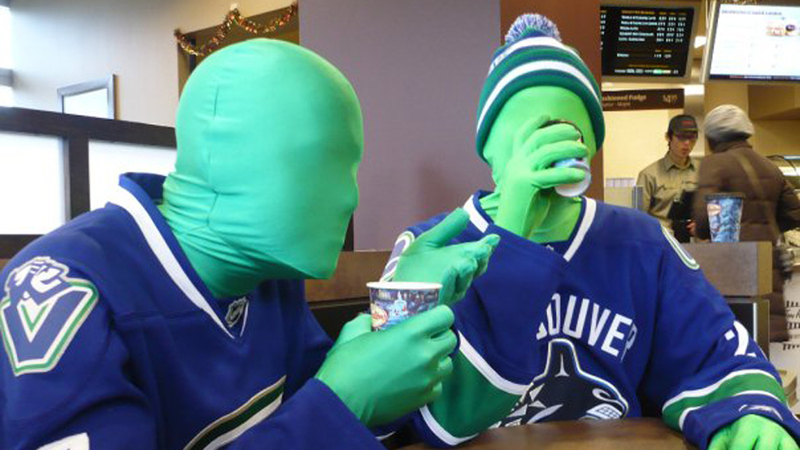 “Essentially we were watching the show and we thought it would be hilarious if we went to a Seattle Seahawks dressed in green team colours, but things didn’t work out the way we had planned, so we went for the next best thing, a Canucks game,” said Force, the taller of the pair in the lighter suit, who recently gave Canucks.com an exclusive interview. Following their appearances at GM Place, Force and Sully became YouTube viral sensations with over 280,000 views of their antics. They were also featured on Sportsnet, TSN and The Score. All that attention, naturally, spawned all sorts of crazy rumours, including a tall tale that Mike Gillis was so enthralled by Force and Sully’s antics that he personally called them and offered them tickets to sit beside the penalty box for any game they’d like to attend. Sully, the shorter of the two in the darker suit, works for a roofing company that has access to the seats beside the penalty box, that’s how the green men continually score the sweet seats. Despite the front row view, scoreboard appearances and fan admiration, Kermit the Frog wasn’t lying when he said it's not easy being green. The taut suits, for starters, are as thin as a slice of cheese and they provide about as much coverage as SPF 5 sunscreen. If the dance moves whipped out by Force and Sully appear sporadic at times, it’s because they’re simply flailing for warmth. Being a true green man, according to Force, means wearing the suit from top to bottom with no alterations. With hockey a sport best watched with the eyes and there being no eyeholes in the suits, the pair often struggle to follow the action. For a pair of 20-something students, dealing with frosty temperatures and a lack of vision is no big deal. What does cause a problem, however, is that their suits are each a one piece. Do the math: no washroom breaks = no beer = not a lot of dance moves. “We’re still trying to figure out the dilemma with drinking beer and going to the washroom,” chuckled Force. In the end none of the negatives matter, Force and Sully are having fun. Hopefully for the greater good of the Canucks.